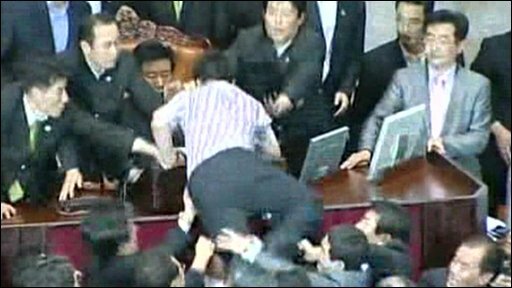 Chaotic scenes erupted in South Korea's parliament as politicians introduced a bill on media reform. The session descended into a mass brawl as politicians from both sides pushed and wrestled each other while some tried to jump the Speaker's podium. The bill was finally passed by the Deputy Speaker after the Speaker was blocked from entering the room.